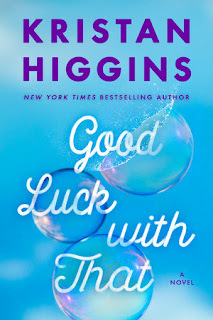 I know Kristan Higgins from the very enjoyable Blue Heron series, but now she's writing outside of the romance genre. Good Luck With That is the story of three friends who met as teenagers at "fat camp" and have stayed close over the years. Marley and Georgia especially so, but Emerson has kept her distance a bit. When they are reunited at Emerson's deathbed, she leaves them a final wish: complete the list of goals they made when they were teenagers. The list was called Things We'll Do When We're Skinny and included items such as "eat dessert in public," "get a piggyback ride from a guy," "tuck in a shirt," and various other things they felt they had to be skinny in order to do. Emerson's death was directly attributable to her vast weight gain, causing difficulty moving her from the house to the hospital and requiring a specially sized casket after her death. When Marley and Georgia arrived at the hospital to visit Emerson, they were shocked and appalled at her condition. I was very taken aback in those early chapters and wondered if the book was going to be fat-shamey, but stuck it out. I didn't yet know Marley and Georgia, and had I been able to get to know them before they appeared at Emerson's bedside I think I would have felt better about their reactions to her condition. Although she dies early in the book, we do get Emerson's story through the journal entries she left behind. It was a pretty sad story, and isolating herself from her closest friends made it all the more worse. Marley and Georgia weren't without their own struggles. Georgia was the thinnest of the three, constantly being encouraged/shamed by her mother, who arguably had her own serious eating issues. Georgia, an attorney turned preschool teacher, was once married to a fantastic man, but basically sabotaged the marriage because she was so uncomfortable with herself and didn't think she deserved him. Now, he has appeared again in her social sphere and she realizes she still doesn't have closure over their failed marriage. Marley is a personal chef with her own business, who pines after her brother's coworker, a guy who she's slept with a few times but who keeps his distance in public. Marley is probably the most well-adjusted and ok with herself character in the book. I really liked Georgia and Marley's friendship, and the way they honored Emerson's memory by working to complete the items on the list - but not waiting until they were skinny. This isn't a book about weight loss, but rather about the relationship women have with food and their weight and the pressures to be thin, and the way we think we need to be a certain size in order to deserve love and happiness. Sometimes it made me uncomfortable, which is not a bad thing, but mostly I got really sucked into these women's stories. Kristan Higgins is noted for her humor, and there were many many funny moments in this book. It was super easy to get into and I couldn't put it down for the very few days I was reading it. There was a lot going on in the characters' lives - much more than even what I've mentioned - and I was very invested in their stories. The style reminds me a lot of old school chick lit, which I really miss. Although there are serious issues, it's told in a light and upbeat way with a lot of humor, and although it's not a romance there is definitely romance in the story. It's a perfect summer read. Good Luck With That is due out in August. I received my copy courtesy of the publisher, and was not compensated for my review.